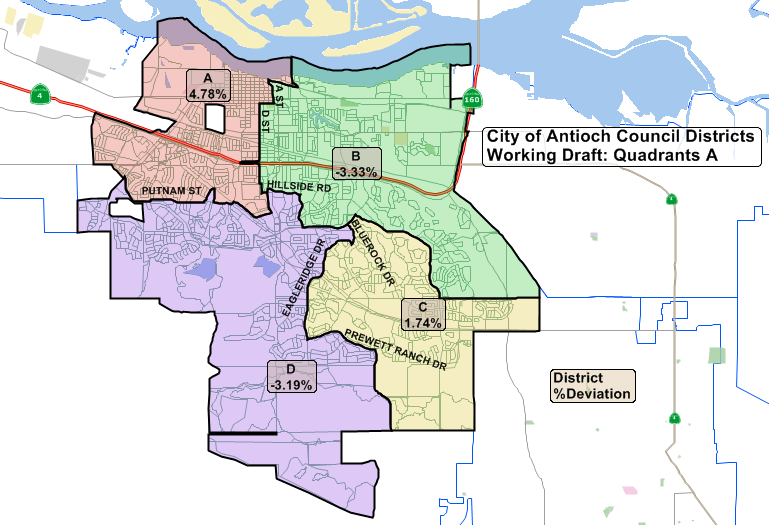 One of the two “quadrant” maps of proposed council districts created in response to the input given at the March 10th council meeting. 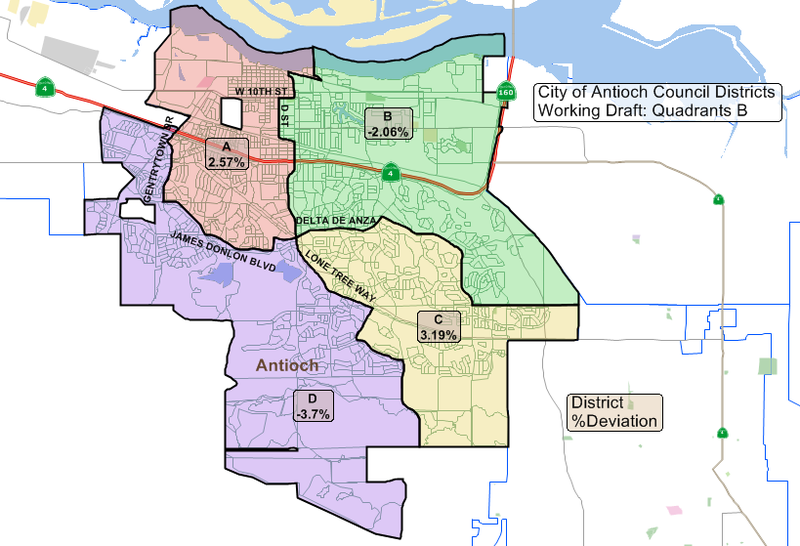 At their meeting on Tuesday night, March 27, the Antioch City Council will consider narrowing down the choices from four to two of the alternative maps for creating the new council districts in time for this November’s elections. One idea and alternative map of increasing the number of council seats from four to six, for a seven-member council including the mayor, was rejected at that meeting. This is one of two proposed council district maps that keeps all of the area north of Highway 4 in one district. A separate issue for which Council direction is necessary is on when to have the district elections begin. To this end, I include correspondence from the County Registrar of Voters, who has expressed concerned about his office’s ability to implement district elections in the upcoming general election this November (which is the first available election in which Antioch could switch to by-district elections.) I question whether the Registrar has the authority to not implement districting elections starting this year, but I did want to convey his statement to the Council for your consideration. Staggered rollout of district elections starting this year. In this scenario, the City would keep the two at-large seats of the councilmembers whose terms do not expire, and it would implement two of the four districts for this November’s election; then in 2020, the City would replace the two remaining at-large seats with the two other districts. This would keep the current staggering of elections in which two councilmembers are up for election each election cycle. County Clerk-Registrar of Voters Joe Canciamilla said that the best way to implement the district elections, this year would be for the maps to be drawn using existing precinct lines. 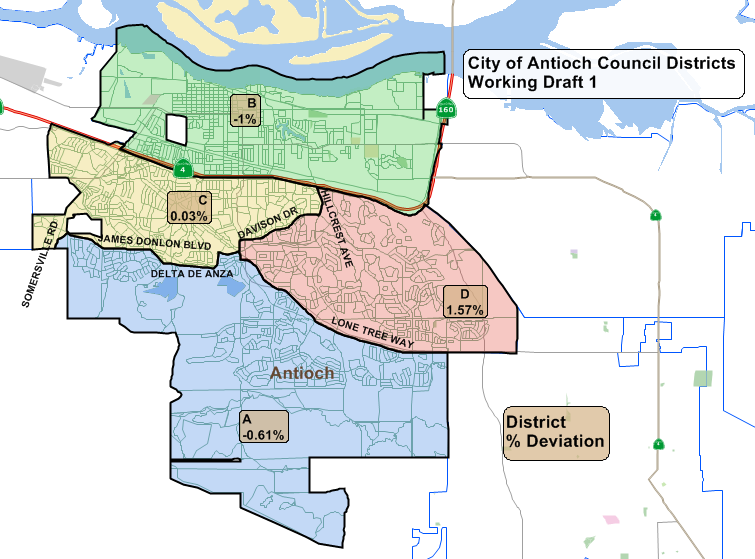 According to Jaime Clark of Q2 in her presentation at the March 10th meeting, less than five precincts in Antioch have been split in Map 1. At their April 10th meeting, the council will first decide to approve switching to district elections and then, if so, which map to approve for the 2018 and 2020 elections. Finally, they will decide whether to have a staggered rollout in 2018 or implement district elections all at once in 2020. If the council approves district elections, whichever map they choose will last until 2022, after the next census in 2020 and redistricting in 2021 when a new district map will have to be created. 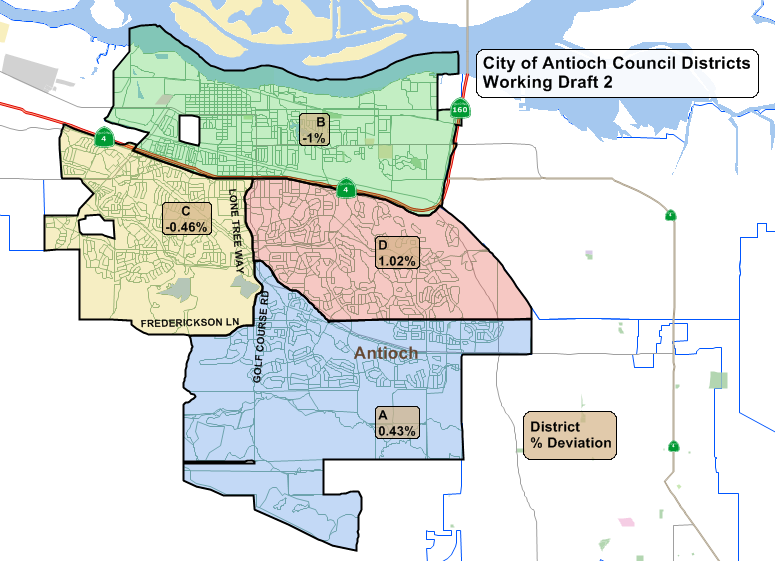 The council meeting begins at 7:00 p.m. in the Council Chambers at 200 H Street in downtown or it can be viewed on local cable access channel or via live stream on the city’s website at http://www.ci.antioch.ca.us/CityGov/citycouncilmeetings.htm. This entry was posted on Monday, March 26th, 2018 at 10:00 pm and is filed under News, Politics & Elections. You can follow any responses to this entry through the RSS 2.0 feed. You can leave a response, or trackback from your own site.